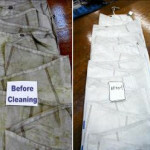 We clean sails, covers, and more. We safely remove mildew, green algae, rust, and dirt. All work is professionally done by hand—no machines or scrubbers—and is absolutely safe for all types of sails and covers. Enjoy a fast turn-around: sails are returned in about two weeks. We also offer a variety of location for your to drop off your sails.